The last two months have been remarkable for fans of Japanese games and with the release of Nioh for PlayStation 4, the trinity of highly anticipated, long in-development games is now complete. We’re, of course, talking about Final Fantasy 15 and The Last Guardian – two games that, along with Nioh, were first announced more than a decade ago. All three games have undergone a significant transformation since then but perhaps none more than Nioh. What we have in the end is a dark, brutally difficult action game that combines the best elements of Ninja Gaiden and Dark Souls into one remarkable package. This is, simply put, Team Ninja’s return to form. 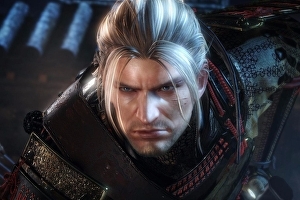 At first glance, Nioh is a visually conservative game – one that pushes modern post-processing effects and cutting-edge rendering techniques off to the side in favour of a more reserved presentation. It won’t leave your jaw on the floor by any means, but over time, it leaves a strong impression. In many ways, it feels like an evolution of what Team Ninja started with the 2004 iteration of Ninja Gaiden – sharp, clean lines and detailed texture work combine with fast, fluid animation to great effect. Rather than relying on features such as parallax occlusion mapping, for instance, Nioh instead adds surface detail through sheer geometric density taking a page from Dark Souls 3 and Bloodborne, in a sense. Large, rocky surfaces undulate convincingly while fully modeled tiles make up the ground on which you walk. Nioh simply oozes with atmosphere thanks to stylised lighting and weather effects. The rain-swept village encountered early on fills the screen with droplets which, using a screen-space technique, take on light from surrounding torches and attacks. Texture work is solid with plenty of detail slathered across each scene while specular highlights allow for dynamic lighting to play nicely off the detailed terrain. Character models feel like an evolution of what we’ve come to know from Team Ninja with rounded edges and clean lines. You’ll run across a handful of low resolution assets here and there but the overall appearance is solid. Final Fantasy 15’s first two big DLC episodes have been dated, with musclebound hunk Gladiolus leading the charge with his story being told on March 28th (). 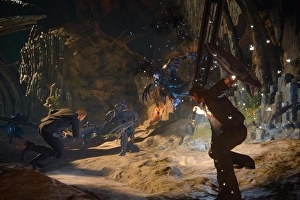 Prompto, the photographer of the group, is getting his episode sometime in June while we’re yet to receive details on when Ignis – the best boy, thank you very much – will be receiving the same treatment. 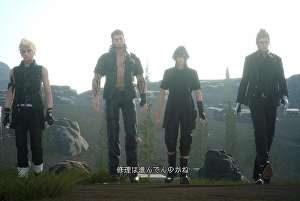 Each character will present a slightly different playstyle to that employed by Final Fantasy 15 lead Noctis, and as you might expect given his stature and physique Gladiolus will bring a more physical edge. Before then, a Booster pack is coming on February 21st that introduces a Magitek Exosuit that makes players invincible for 30 minutes. For all its pomp and grandeur, Final Fantasy is so often at its best when it’s being a little bit dumb. 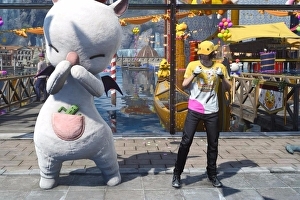 And it doesn’t really get much dumber than the Moogle Chocobo carnival that’s just launched as a free update to Final Fantasy 15. A standalone of sorts that’s unlocked once players have reached Altissia, the carnival repurposes the Venetian city as a colourful parade of mini-games that offer enough diversions to while away an hour or two. Square Enix has certainly put the elbow grease in to make it worthwhile, and there’s a surprising amount to see and do here. Is any of it actually that good? I’m not wholly convinced – the Chocobo racing is cute but throwaway, a shooting range and Cactaur-themed game of whackamole are equally slight and the only activities that last more than a couple of minutes are extended treasure hunts that are as torturous as they are titillating – but I’ve had a lovely time in the carnival nevertheless. As the owner of two moogle plushies and someone who’s constantly scouring Etsy for a moogle outfit for my nine month old daughter, I was always likely to be a pushover, but there’s a goofiness to the whole thing that I think anyone can get onboard with. Within seconds of entering the carnival I was dancing alongside a man in a moogle suit; shortly after, I was warping from point to point in pursuit of a child’s rogue balloons. Final Fantasy 15 famously spent over ten years in development, yet when it came out last November it still felt incomplete. 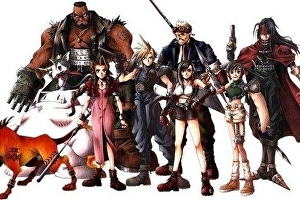 Big edits had clearly been made, leaving the story potted with plot holes and inconsistencies while the open world narrows down to a corridor in the final half of the game, suggesting it was rushed over the finish line before director Hajime Tabata and his team could fulfil their vision. 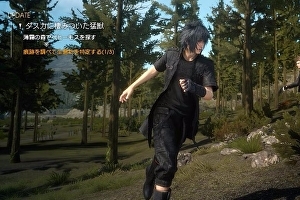 Now, a player has discovered a glitch that opens up a whole new expansive area to explore – and it’s polished to such a degree that it must have been cut at the 11th hour, or that it’ll form the backdrop for the incoming DLC that will explore the stories of sidekicks Prompto, Ignis and Gladio. A video on YouTube by Fotm Hero explores the continent of Niflheim in its entirety, which in the final game players only see from the interior of a speeding train. Areas such as Cartanica look finished other than their lack of enemy placement, while further in the snowy area of Eusciello looks like it needs a little more work. Final Fantasy 15 has now shipped and digitally sold 6m copies, publisher Square Enix announced today. It sounds like a lot – but how well is it doing? 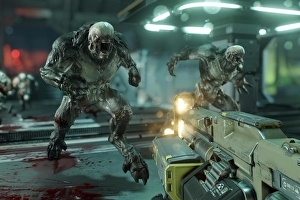 That total refers to sold digital copies but only shipped physical editions – meaning those which have been produced and sold to retailers, but not necessarily sold to the public. Japanese sales are currently down around 1m copies when compared to Final Fantasy 13 – although some of this can be blamed on the country’s shrinking home console market. Time is seriously about to run out if you’re yet to finish all of your Christmas shopping. These are now the last desperate days of scrambling for deals before they go out of stock and the hurried purchases of a final few items. Then, you can relax: crash out in front of Wallace and Gromit with a drink in one hand and chocolates in the other, admiring all bargains you took advantage of over the last few weeks. Ready to do it all again next year? No? I don’t blame you. Anyway, while we’re on the cusp on last shipping dates there are still deals to be found across the tech and gaming realm. Perhaps, instead of picking up something for someone else, you might want to reward yourself with an early Christmas treat. Come take a look at what’s on offer. Games, I think, have long been inspired by the daydreaming sentiment behind Clarice Bean’s earnest musing. We are used to speeding, double-jumping and flying through space without the rigid pull of the Earth’s mass. And I think this year especially games have taken more notice of not-Albert Einstein, and given greater consideration to why things happen, when. 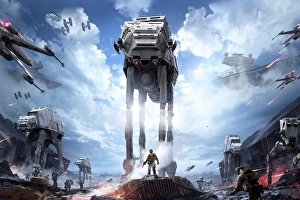 What follows isn’t a grand theory of how time appears in games in 2016 – you’ve got the wrong guy for that, I’m the guy who just quoted a children’s book in an intro – but a survey of why, more than other years, 2016 had the tang of time about it. One way time has imposed itself on 2016 is with the arrival of games previously caught in protracted development. I’m talking about the un-vapouring of The Last Guardian and Final Fantasy 15 in particular, though they both feel in some way related to our current wish-fulfillment crowdfunding culture, where sometimes just longing for something hard enough can make it real. 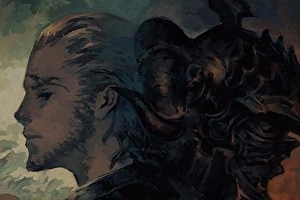 Final Fantasy is, of course, a series locked into a constant process of self reinvention, its numbering sequence more like software versioning than a marker of continuation – it’s just that Final Fantasy 15 underwent this process on its own and unreleased. In the end, the finished game feels new, all traces of decade-old systems iterated away during production, even if screenshots and trailers of its evolution exist in the amber chambers of the internet.